(Cam has lots of vacuum for power brakes. (This cam has a little less vacuum, but it's okay for power breaks, and it has the best Old School sound. Stall speed converter required. The normal price of these engines is $100 more. Buy now to receive the special pricing listed here! 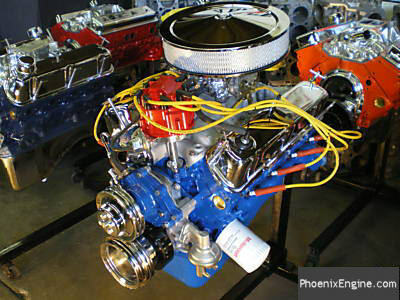 This Power2 engine combination has a great Old School sound. It is a great replacement mild street engine! 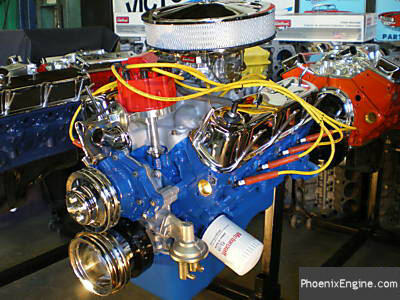 This engine has a MILD to ROUGH IDLE, Comp Cam Kit CAM that puts out 331HP at 5200 rpm and 342 ft lbs of torque. You will need an 1800 to 2200 Stall Speed Converter. 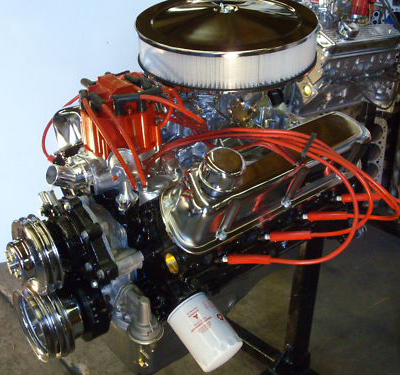 This Power 2 Engine Combination is great for the everyday driver, in your MUSCLECAR, Street Rod, Hot Rod, Kit Car, Custom Truck, BRONCO, 4x4, JEEP or Ford 4-wheel drive. 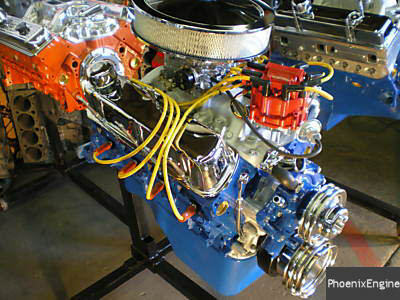 This Engine is a Seasoned Hand Picked Block. Plugs, Plug wires. Call for colors! New chrome air cleaner included. Custom air cleaners extra. 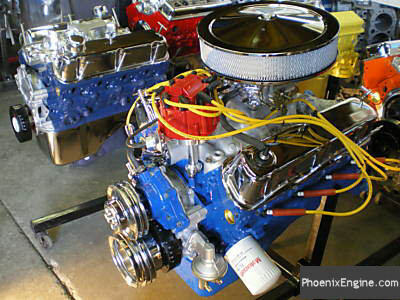 OR new Edelbrock aluminum intake manifold. Polished or RPM dual plane intake manifolds are extra. 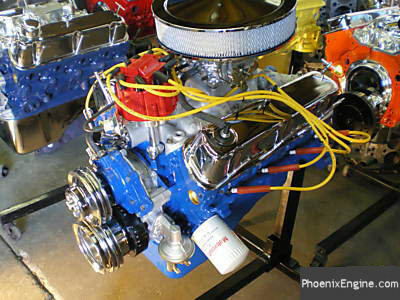 This engine will run on 89 or 91 Premium unleaded fuel. 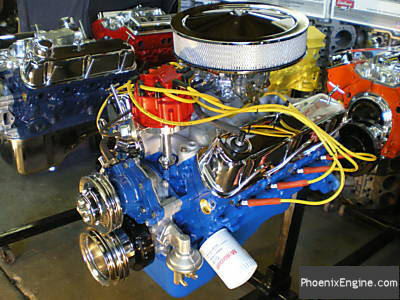 Built based on one of our Dyno tested and road proven packages. Don't forget to call us for pricing on Fast Track Start up and Break-in! 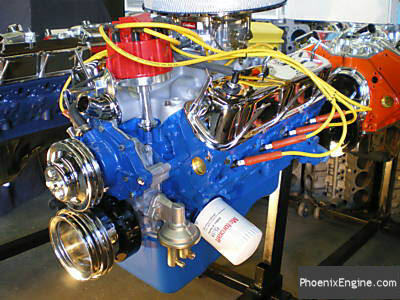 Here's a listing of the parts and machine labor for your Power 2® engine from PhoenixEngine.com. 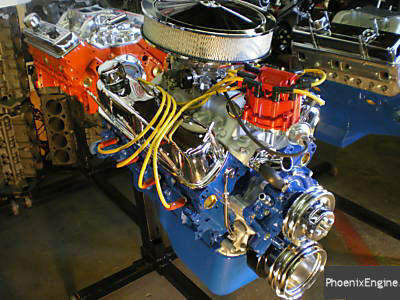 VIDEO: Click HERE to see our FAST TRACK startup in action on this engine! 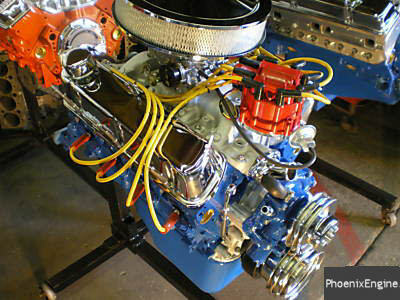 This is the Ford 302 290HP. VIDEO: Click HERE to see the same engine after Fast Track Super Tuning, with open headers (awesome sound)! YOU WILL NEED to call us - 1-888-766-8044. There are too many variables on each application. 289 - 302 - 351c - 351m - 351w - 400m - 390 - 427 - 428 - 429 - 460 and more!